Well known for his public gaffes, Joe Biden has been once more fooled. Vladimir Putin tricked him with a proposition to abolish visas between the United States and Russia. Biden first responded it was a good idea before he had to seriously backdowned! After noting joint projects on the table — cooperation on missile defense and Russia’s accession to the World Trade Organization, among others — Mr. Putin cheerily suggested a brand-new idea: abolishing visa requirements between Russia and the United States. The early part of the meeting was featured on Russian television. Mr. Biden responded “Good idea,” and Mr. Putin seized on the response, saying he hoped Mr. Biden would make the case for the change in Washington. The vice president then backpedaled, explaining that he does not decide such matters. “Mr. Prime Minister, in case you haven’t noticed, there’s a real difference between being president and vice president,” he said, perhaps referring to the structure of Russia’s leadership, in which Mr. Putin occupies the country’s second-highest post but is widely viewed as its paramount leader. Visa liberalization had been the subject of informal discussion before the meeting, said Anthony J. Blinken, the vice president’s national security adviser. “The Russians know full well, as do the Americans, that there are legal requirements set by Congress to be met for visa liberalization that the Russians have not yet achieved,” including bringing the visa refusal rate down below 3 percent, Mr. Blinken said. The Russian press on Friday reported Mr. Putin’s proposal as top news from Mr. Biden’s visit, shifting the focus from coverage of the vice president’s public criticism of Russia’s legal and political systems. One report the next day suggested the prime minister had succeeded in disarming his visitor. When President Obama visited Russia in July 2009, his breakfast with Mr. Putin ran for two hours, the first of which was largely an uninterrupted monologue by Mr. Putin, aides said afterward. After, Mr. Putin and Mr. Biden met privately for 15 minutes in Mr. Putin’s office. On Thursday, a senior American administration official, speaking on the condition of anonymity, described the meeting as “a serious discussion about serious issues,” including cooperation on missile defense, accession to the World Trade Organization, Georgia, Afghanistan and energy. On Friday, Mr. Biden continued to Moldova, a former Soviet republic where a pro-Western coalition took power in 2009, displacing an old-guard Communist leadership. Addressing an overflow crowd in Opera House Square in the capital, Chisnau, where young demonstrators gathered two years ago in what became known as the “Twitter Revolution,” Mr. Biden linked Moldova’s transition to the uprisings that have upended North Africa and the Middle East. As Mikhail Gorbachev turns 80, some prominent Russian leaders have been asked to tell what they think about USSR’s last leader… Not to say they do not all agree! Petr Aven, President of Alfa Bank. Gorbachev came to give us freedom, and he changed our life for the better. He may not have known what he was doing, but I think he did a good job. He made a huge breakthrough, renewing our country without blood and violence. Alexander Tkachev, Governor of the Krasnodar Region. He is the man associated with the greatest geopolitical drama in Russia’s contemporary history. As a result of huge imbalances in the alliance of forces in the international arena, he became “the best German” and the best friend of the West, but for most of our great Motherland’s people, his name is associated mainly with countless problems and irrevocable losses. Alexander Lebedev, co-owner of the National Reserve Corporation and Mikhail Gorbachev’s partner in planning an independent democratic party in Russia in 2008. He is the embodiment of the Socratic principle that the best should rule. He taught us moral values at the highest level. This man changed the entire world for the better, not just the material aspects of his personal life, as is the case with many politicians. Alexander Rahr, Director of the Berthold Beitz Center at the German Council on Foreign Relations, author of Gorbachev’s biography. He is the only living man to have changed the course of history. They don’t like him in Russia because he destroyed the empire, but he did it together with Yeltsin, at least. He is a mystery for me, I still don’t quite understand whether he had expected what was to happen, whether he really wanted to give freedom to nations, or he was simply too weak. Mikhail Barkov, Vice President of Transneft. As many knowledgeable people in the West, I consider Gorbachev to be short-sighted, cowardly and greedy. At a sharp turn of history he showed himself in the negative light, although there were some good moments at the beginning. He had no idea where he was leading the country. Nikita Belykh, Governor of the Kirov Region. I am grateful to Gorbachev, because he gave freedom to the country. Yes, he did make mistakes, but who didn’t? Gorbachev has really done a lot to change the country for the better. Andrei Ilnitsky, Deputy Head of the Central Executive Committee of United Russia. He is the first Soviet politician who did not resort to violence in order to keep the respect of the woman he loved. The history of Gorbachev’s success is the history of his love. He considered himself unworthy of his wife, and he had always tried to prove that he was the right man for her. I did not have much respect for him during the 1980s and 1990s, but now I think I understand him, and I now have great respect for him as a person, and sympathy for him as a politician. Mikhail Yemelyanov, member of the State Duma for A Just Russia. He is a political loser. He tried to head the country during a difficult transition period, but he was not up to the task. Everything he did led to the collapse of both the system and the country. Alexander Pochinok, a member of the Federation Council, Tax Minister in 1999-2000. Gorbachev is the savior of the world, who helped reduce the threat of a third world war. This threat had been a nightmare for decades. With difficulty, he eased the great standoff of the bipolar world. It is only for this reason that Gorby will always be remembered. They all say: This could have been done better, but why then didn’t anyone do it better? Vladimir Pekhtin, First Deputy Head of the United Russia party in the State Duma. I believe that Mikhail Gorbachev is a demagogue and traitor. He unleashed perestroika to meet his own political ambitions, and he ruined the country shamefully. And now, he speculates in a dignified tone on how efficient the president, government and United Russia are. It doesn’t take much to criticize and advise, but when Gorbachev had a real opportunity to care about Russia’s well-being, he not just missed this chance, but he plunged the country into chaos and absolute decline. We are still dealing with the negative implications of his reforms. Grigory Yavlinsky, a member of the Political Committee of the Yabloko Party. Gorbachev is the man who brought freedom to people. What they did with it is not his responsibility. Ruslan Khasbulatov, Head of the Supreme Council of the Russian Federation, 1991-1993. He brought democracy to our country – something neither Yeltsin nor Putin were able to do. At the same time, the huge number of Gorbachev’s mistakes will always be remembered. His economic reforms were not just abortive but they destroyed the powerful country. Vladimir Khotinenko, film director. It is too early to judge, Gorbachev left politics not so long ago. But I am convinced that he was the man Russia needed at the turning point in its history. Gorbachev played no role in my life, because I have never depended on the political situation. Alexander Kiselyov, General Director of Russian Post. The greatest figure in the 20th century history, he has played a huge role in both Russian and world history, and he has already immortalized his name. In May 1985, he made his first visit as General Secretary, coming to my native Leningrad. I was lucky to see Gorbachev at an arm’s length: He went out to the people, passing the guards, and began to talk with us. I liked this openness. Ilya Yashin, a member of the Political Council of Solidarnost. He opened Russia’s borders and changed the entire country. Despite his contradictory reforms, he gave freedom to millions of people. No doubt, he is part of our history. Valery Khalilov, Head of the Defense Ministry’s military band service. Gorbachev is the symbol of the past era, which saw the disintegration of the Soviet Union, the collapse of the Communist Party and the Communist ideology. To everything there is a season, and at that time Gorbachev was the right man. I see him in a rather positive light, though there are some weak points, too. Igor Yurgens, Chairman of the Management Board of the Institute of Contemporary Development, Vice President of the Russian Union of Industrialists and Entrepreneurs. He is the man who taught me the word “consensus.” Before Gorbachev, it was either abusive or unknown. He introduced it not just to the political vocabulary but also to our life. I know that Gorbachev had an opportunity to cling on to power up to the last moment, and he had a better chance compared to the current leaders in the Middle East, for example. Guided by his ideas about consensus, however, he chose not to do so and brought violence to a minimum. This alone is worth a monument. Alexander Rutskoi, Vice President of Russia, 1991-1993 (in 1993 he led the standoff with the then-President Boris Yeltsin). 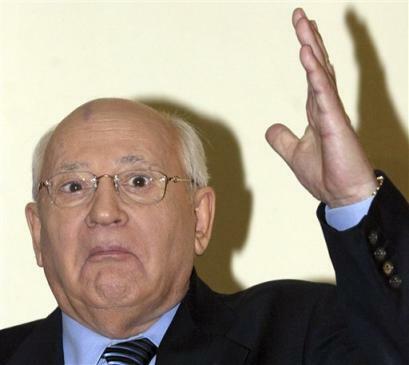 For me, Gorbachev is the man who betrayed his country and his people. Some politicians credit him with democratization, but I think democracy could have been built without the destruction of the country. Kseniya Sobchak, TV host (and the daughter of Anatoly Sobchak, leading democratic reformer of the early 1990s). He is certainly a man of his era, and he can be assessed differently. He left politics, he lost the love of his life, but he remained a Man with a capital M. His reforms were rejected by the elite, I myself do not understand certain things, but he was driven by idealism, which is much better than the pragmatism and cynicism we have now. Valery Semyonov, Vice Chairman of the regional parliament of the Krasnoyarsk Region. There would have been no changes in the country hadn’t it been for Gorbachev, and Russia would not be part of the international community now. He gave us freedom to think, move and travel abroad. The only thing that cannot be justified is the collapse of the Soviet Union. Anatoly Lokot, First Secretary of the Novosibirsk Regional Committee of the Communist Party of Russia. He is the man who disappointed the hopes of a great nation. With his policy, he brought the country first to an economic crisis, and then to political disintegration. Tellingly, he celebrates his birthday not in Moscow or the Stavropol Region, but in London, because no one needs him here. Pavel Sigal, Vice President of OPORA ROSSII, an organization of small-and medium-sized business. He is an outstanding politician who initiated huge reforms in Russia and in the rest of the world. Future generations will appreciate that. What he accomplished is much greater than what he failed to do.